Vertical files, also called subject files, are a collection of miscellaneous documents and ephemera organized in file folders and stored in filing cabinets. These files are a hodge-podge of records that have been donated to the archive and could contain any kind of records that would fit into a file folder. 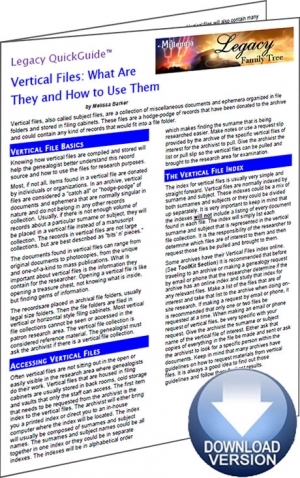 The Vertical Files: What Are They and How to Use Them Legacy QuickGuide™ contains useful information including a review of how to locate vertical files, how to access individual documents and use them in research and more. This handy 4-page PDF guide can be used on your computer or mobile device for anytime access.